HORROR. HUMOUR. WHAT A GREAT VISITOR! That she flew away without her head! A good write, the sensuality was prominent! 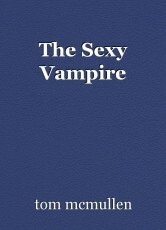 I remember a time as a teenager where I wanted to date a vampire (probably around the height of twilight) and reading this took me back in time. Well done! Thanks M...Wisdom, the Vampire Diaries are on T.V. here at moment they look very healthy and attractive!